We talk with Choo Leng Goh the livewire and disarmingly direct general manager of The Athenee Hotel Bangkok - A Luxury Collection Hotel - about what a hotel rebrand means for guests and her particular no-nonsense hospitality style. Singaporean-born and Thailand domiciled Choo Leng Goh cuts an elegant figure as she descends the grand staircase donned in a simple floral black-and-white dress, carefully surveying the new-look lobby. Her watchful expression creases into a warm smile as she approaches with none of the telltale signs of a hotelier who is feared as much as she is revered. Speaking with Editor Vijay Verghese on a warm May evening, her eyes sparkle with mischief – occasionally distracted by something that needs attending to. A glance at passing staff, and it’s done. She is brimming with anecdotes. Her years in the business have diminished nothing of her femininity in what until recently was considered very much a male preserve. Choo Leng did a tourism course at the University of Hawaii before enrolling at the prestigious Ecole des Roches in Switzerland. She joined Starwood in 2003 to be eventually elevated in 2010 from Hotel Manager at the Royal Orchid Sheraton Hotel & Towers to GM of both The Plaza Athenee, a Royal Meridien Hotel and the Le Meridien Bangkok. Her thoughts on travel, the changing needs of guests, and the pursuit of happiness. Smart Travel Asia: How did you pick hotels? 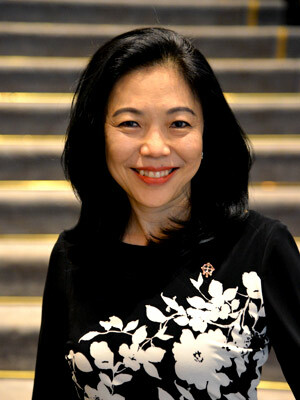 CHOO LENG GOH: I came from a family of three and our focus was always finance and business management. I thought this was all so boring and thought of hotel schools in Europe. What about hotels attracted you? CLG: I started with international business initially and then thought I should give hotels a go after a gap year. I always worked in operations with people. It is awesome having hundreds of people from all walks of life under one roof. It’s very interesting. CLG: We are in a HAPPY industry [turns with a broad smile, hands emphasising the word]. Our job is to make people happy, to do something special. People utilise hotels for positive things and we play a role in this. CLG: We are always facilitating travel, trying to make it easier [for guests]. Even today. It’s about people. It may not be personal sitting in a corporate office but in operations you make money by making people happy. Wow! To work in this industry you have to genuinely like people. And just like a barber gets to know all the secrets, we learn a lot about other lives. We are good listeners but we don’t share [laughs]. I had many opportunities to switch to mutual funds and banking but I didn’t because there, money was the only objective. Here I have to keep my stakeholders as well as guests happy and this is done by doing well on basics. Does it make sense? What do you bring to the party as a woman? CLG: Women tend to be focused more on details and are conscientious. I believe I have an eye for that. Of course we are all emotional. Sometimes you need some slack because people are upset or calling you names. It happens. You cannot argue with an angry person. It all comes down to listening. And patience. How does being a woman affect your working style? CLG: I am very serious about sexual harassment. Now that I’m a GM it’s less but when I worked in male dominated departments the humour was always very masculine and sexual and I was always very outspoken on this. I’m not into football and beer to unwind. Why don’t we go [with male colleagues] to do nails and spa [laughs]? But I believe we should be inclusive and I like a diverse team, people with alternative lifestyles. This offers diverse opinions and better solutions. How did you manage your work-life balance? CLG: Well, I can’t delegate my pregnancy – it’s a physical thing. I’ve been lucky in my career and had great and understanding bosses. I cut travel where I could and later with good help at home I was able to spend time with my kids. Now that they are teenagers I need them more than they need me [smiles]. Being a working mum is good because our time is high quality and they learn to be independent. Are you affected by sharp staff turnover? CLG: Here 30 percent of my associates have been here since day one 18 years ago [under the earlier Plaza Athenee]. I am blessed with the senior associates that are still at the hotel to maintain stability. Some turnover is good to bring in new talent and we are in good shape despite many new hotel openings. Is a millennial guest like any other? CLG: With millennials it is a learning process for staff. The phone is their oxygen and they have to be connected 24 hours a day. That’s why we supply a [bedside] cable connector in a pouch. Millenials are very focused on food. They may be vegetarian or vegan. They are concerned about where the salmon came from. They want gluten-free dishes. Generally they are more health conscious. We have millennials on our team too. I look at them as delicate plants that need watering. In the old days we just figured things out the hard way. Millennials get bored fast so you have to keep them challenged. Some leave of course, but the industry is so small, they eventually come back to a more senior post. CLG: For a product it is something that looks expensive and is rare. As a service we offer luxury through observation and response. If I intuit your need it is better than waiting to be told. Let’s say a platinum guest books a car for 9am. We might enquire if a shirt needs pressing for a meeting. That is a level up. We have to go the extra mile and learn from mistakes. Our airport reps may have a guest come up to them and make enquiries for getting into town. They haven’t booked our hotel car but the rep would help them with arranging a taxi or limousine. Let’s say it’s someone’s birthday and we’re serving a complimentary cake. But what kind of cake do they like? We need to ask that extra question. Sometimes staff are less motivated but good reviews mentioning names always gets people enthusiastic. Have you ever suffered blogger blackmail? CLG: I’m very bad with blackmail. I like people to be fair. If there’s a genuine bad experience I’m more than happy to iron it out. But if people make demands online say on TripAdvisor I don’t care. I won't give in on principle. Of course we reply to online posts and we read all reviews and one-star comments get a quick response. Some guests are known to be ‘difficult’ while others are ‘easy’. But why is he difficult? Maybe he has a reasonable expectation that has not been met. When you analyse this it changes your perspective. Guests don’t come here to be difficult. No one wants to ruin his stay. So what can we fix? We had a VVIP guest who personally booked the presidential suite and then found his airport transfer was not in our system. Our airport rep apologised and put him in a regular car. The guest was understandably upset and wanted to see the GM. We had a three-hour chat. I listened. He didn’t want a complimentary room. It was more the loss of face in front of his junior colleagues who were accompanying him. I apologised and emphathised. Later, knowing he liked Thai food, we organised a nice Thai dinner. It developed into a good relationship. What makes a great hotelier? CLG: Happiness is an important ingredient. Make people happy and you bring in profit. But you need to understand the changing nature of ‘happiness’. Twenty years ago, silverware was ‘luxury’. Now it’s the ‘experience’. People will talk about their experience for years, not the silverware. A hotelier cannot be negative. Does a GM need to be visible? CLG: Yes, as much as possible. It is good to talk and get feedback. I try to be available for breakfast sessions and sometimes in the evenings.